And Winter Love Too! This is the first of four seasonal "Merry Little" designs. 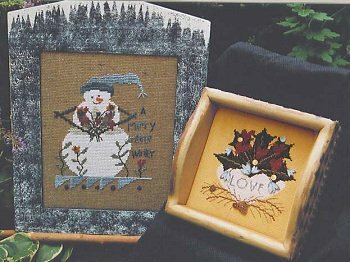 A Merry Little Winter is stitched on Wichelt 10 count Hickory Heatherfield using Caron Collection Watercolours Black Forest, Cinnabar, Moss, Night Sky, Opal, Sage and Silver Blue with JABC pack 6334. Frame no longer available. Winter Love is stitched on R&R Reproductions 14 count Busy Bee Blend Aida using Weeks Dye Works Juniper, Kudzu, Lancaster Red and Whitewash plus The Gentle Art Cornflower and Sable. Tray no longer available. Vintage chart with photo glued to cover.